Our new range of stunning wholesale Selenite crystals has arrived! Selenite is a mineral also known as satin spar, desert rose or gypsum flower. These four crystal structure varieties are often grouped together and called Selenite. The name selenite comes from the word ‘Selene’ which is the Ancient Greek word for ‘Moon’. It’s easy to see why this name has been given to this beautiful crystal which has a milky opaque or sometimes slightly pearly transparent appearance. •	Wands which are used for a variety of workings including healing aches and pains. 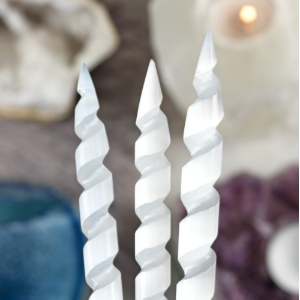 Selenite is well suited to this shape because of the way it naturally forms into long columns. Selenite is sometimes referred to as liquid light due to the way it captures and radiates light – it’s almost like holding pure white light. It’s for this reason it’s associated with clearing your energy field, purifying your space and raising your vibrations. Common practices are to sleep with it under a pillow or meditate with it over your chest as a way to clear your aura. For those who are interested in the seven chakras, Selenite is commonly associated with the Third Eye chakra as it is believed to help reach higher planes and achieve activation of the further senses. Here at Something Different we now offer a variety of new Selenite wands, geodes and stones which are popular essentials in any energy toolbox. Read more about our new arrivals below and discover how they can be used and their benefits. Selenite is often crafted into beautiful ornaments and lamps that can be displayed around the home to help to keep energy in rooms clear and positive. This mountain lamp looks simply stunning when lit and would make a great addition to a bedroom to aid sleep or in one of the busiest rooms of the home such as the living room where lots of energy gathers. We recommend using this candle holder with a white tealight to create an pure ambience. The lit candle highlights the structure of the crystal for a beautiful effect. Selenite spheres are often used for scrying and to enhance telepathy. This item has a more natural finish and is an ideal crystal ornament for using in the home, on a desk at work or to place in meditation circles or on crystal grids for clearing the energy from other stones. This crystal is perfectly sized for holding in the palm, making it an ideal tool for meditation. It can also be used like an eraser by holding it and moving down the body from the Crown to the Root chakra, combing out bad energies. We now stock rounded and spiral wands which are popular tools for spiritual rituals. These wands capture the light in a remarkable way which serves to enhance any magical workings. 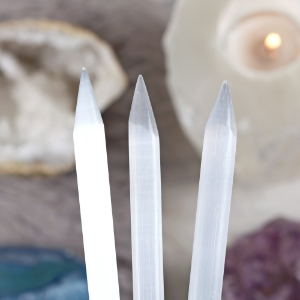 If you’re interested in stocking any of our Selenite products, you can find the full range of lines on our website here. If you have any questions about Selenite, its uses or any of our products let us know in the comments below and we’ll be sure to offer our help.